The Legend Front Replacement Bumpers by Bullnose Bumpers are tough and dependable products designed for the customer who wants the protection of a front-bumper replacement without the grill guard for their Chevy, GMC, Ford or Dodge. Bullnose bumpers offer the "Off-Road Rally" styling with contoured skirts to protect the underside of your truck or SUV and is finished with the highest quality super polyester black pearl powder coating available today for superior corrosion resistance. Standard features include light tabs, license plate mounting holes, 2" receiver hitch, and frame mounting. Select makes and models are now able to retain tow hooks and fog lights. Off-road lights are not standard, but are available as an option. Note: Adding a body lift to your vehicle will affect the fit of our product. These Bumpers are Not Winch Ready. The Summit Front Replacement Bumpers by Bullnose Bumpers are designed specifically for halfton trucks that want tough front end protection as well as the popular Off Road styling. Comes standard with light tabs and the best black powder coat finish on the market. 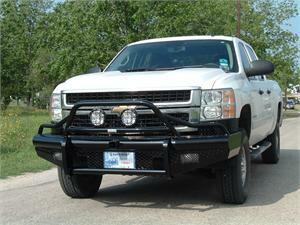 Sturdy frame mounting and retaining factory fog lights and tow hooks are an added plus. It's a one piece welded design made with 12 ga. diamond plate and is available for the newer model Chevy, GMC, and Ford halfton trucks. The H2R hidden 2" receiver and Offroad lights are not standard, but are available as an option. Note: Adding a body lift to your vehicle will affect the fit of our product. These Bumpers are Not Winch Ready.